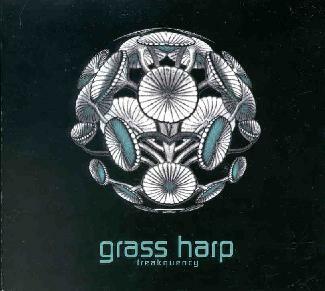 Grass Harp is a German band that plays accessible song-oriented songs that are both softly melodic and heavy rocking. The music with powerful elements of psychedelia and space that would appeal to fans of Porcupine Tree and Dark Sun. The band consists of Andy on drums and programming, Bo on electric and acoustic guitars, Fritz on guitars and theremin, Gero on vocals, Murgi on guitars, bass, and effects, and guests on sitar and samples. On "Frequency" and "Solid" the similarities to Dark Sun's Feed Your Mind album struck me immediately. Gero's vocals are similar to Janne Kuokkanen's and the style is similar. Great rock songs with pop elements but clearly in the space domain. "Solid" is my favorite of the two with its harsh edge and great groove. Among the more melodic standout tracks are "Leaving Venus", "Subatomica", Bo's Lament", "Rubberboat Song", and "Meadow Glow". "Rubberboat Song" is a gorgeous song. I loved the way it developed through multiple themes and great varied guitar combinations. Melodic, and somehow complex. An 8 minute epic. "Leaving Venus" has a nice combination of acoustic and electric guitars, and a trippy guitar solo as a bonus. Really nice sound. "Subatomica" is a similarly flowing song that includes simple but trippy guitar and synth lines. A gorgeous melodic psychedelic song á la Porcupine Tree. "Meadow Glow" is a track that I like but am a bit ambivalent about. The bassline seems straight out of a Porcupine Tree tune I can't immediately place, though I think it's from Sky Moves Sideways. The song goes on too long and doesn't really justify it's nearly 9 minute length, though I really dig the psych rockin' section at the end that pairs guitar and sitar. On the heavier side is "Thursday Afternoon", a tune that is flowing during the verses and head-banging metallic during the chorus. There's a great segment where the synths are soaring while the guitar cranks out rockin' licks. And "Error #29" is Grass Harp's 10 minute Mount Vesuvius erupting freakout of a closing track. The instrumental starts with the guitars rumbling and gurgling as the rocket prepares for takeoff. After a minute or so it launches into an intensely heavy freakout that only lasts moments before pulling back and laying the groundwork for the inevitable next eruption. The guitars are wildly fuzzed, the synths wonderfully spaced, and Gero's vocals painfully harsh. A wild ride into the cosmos. Grass Harp's strength lies in the multiple guitar parts that create tripped out layers of psychedelia but rock hard as well. The songwriting is also solid making the music accessible without sacrificing the instrumental adventures. Recommended.